Great idea and looks sooo much better than the boring covers that are standard. Wow, you're famous! Way cool. I have a can of chalkboard paint that I'm itching to use. 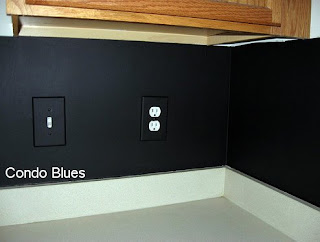 I love your backsplash idea! Clever to paint the covers, too. Great idea! They really add something! This is great! I fear I'm not quite as handy as you are... My bathroom has really old plastic tile in two different colors. There was a box of one color in the basement when I moved in, but none of the other color. But of course, the bathroom had several broken tiles of the color for which there were no replacements. But never fear... I found some paint that matched the color of the tiles that needed replacing and just painted a few of the other colored ones and voila! No more broken plastic tile. I was babysitting my nieces and flipping through the July/August issue and must have missed it! Darn it - I wanted to read the article! That is so cool! And congrats of the feature. Quite impressive! It never dawned on me that you can paint a backsplash with chalkboard paint. May I ask how you did this?